I just tried out this great phone charger for the car by Stalion. I am always on the go these days. I travel a lot of work and even when I am not traveling as a mom of 3 very busy girls I am always in the car running one of them to an activity. So my phone is often in need of charging while we are on the road. That’s where this awesome Car Charger from Stalion comes in handy. I can plug this right into the car outlet and then plug in my phone. It has five USB ports on it so I can charge five devices all at one time. It works really fast and has my phone charged and ready for use in no time. WHY GO WITHOUT YOUR DEVICES ON THE ROAD? With our USB car charger, you can be recharging your smartphone, your tablet, your GPS device and your MP3 players all at one time. Make sure you and your passengers have access to all of the devices with one single car charger adapter. MORE PORTS THAN THE COMPETITION Other car accessories for charging on the go have just one or two ports. With our electric car charger, you get a total of five ports for simultaneous charging. RECHARGE AT OPTIMAL SPEEDS With Stalion Smart Technology, our cell phone car charger recognizes your device and automatically charges at optimal speeds to ensure speedy recharging, and there’s never a drop in performance when all 5 ports are full. 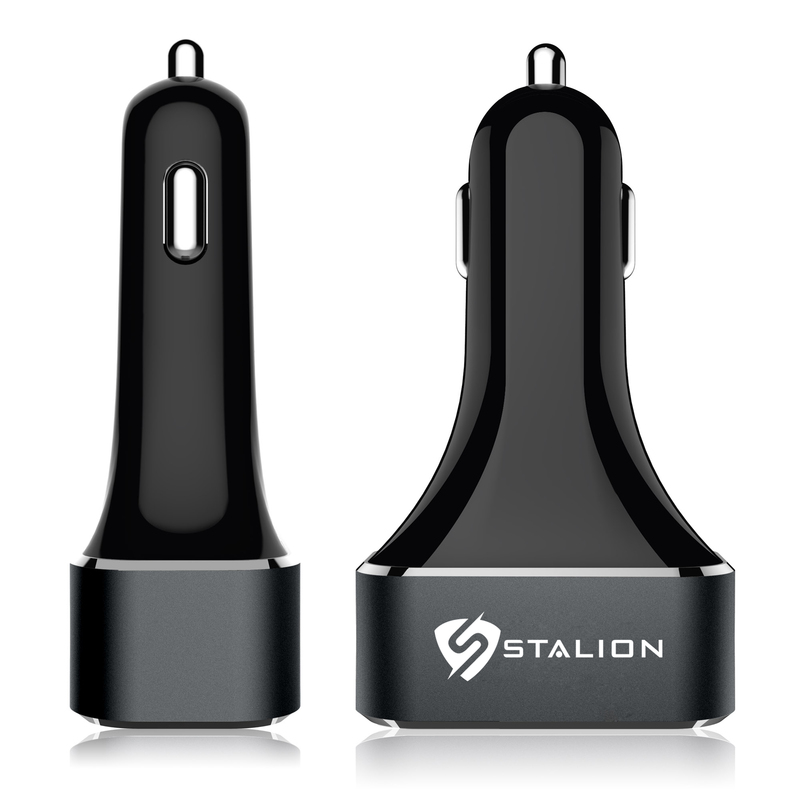 The Stalion 5-Port is a fast car charger whether you have one device plugged in or five! USE WITH VIRTUALLY ANY DEVICE Universal design for all types of devices! You can use it as an Apple iPhone 4 4s 5 5s 5c 6 6s 6 plus 6s plus car charger, a Samsung galaxy s4 s5 s6 edge+ car charger and for charging iPads, other smartphones and tablets, GPS units, iPods, MP3 players and more. If a device recharges with a USB cable, you can likely power it up with the help of our charger. SIMPLE TO USE IN YOUR VEHICLE Our 5 port, 12 Amps, 60 watt charger plugs right into the cigarette lighter of your vehicle. The compact, sleek black charger is easy to store in your glove compartment, console or pocket between uses, so it’s ready to go when you’re ready to charge.